Everything you need to pass the Civil FE and PE Exams. Our mission is to help you on your journey to becoming a professional engineer. The purpose of this site is to help you on your journey to becoming a professional engineer by preparing, taking, and passing the National Council of Examiners for Engineering and Surveying (NCEES) Civil FE and PE exams. And we now offer PDH’s to keep your PE going! This site will provide you with the best breadth and depth practice exams you can find. What certification are you studying for? Are you ready to pass the PE exam? 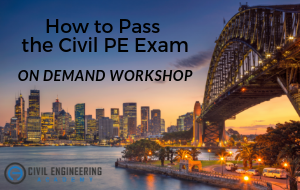 Sign up below for our FREE On-Demand Workshop on passing the PE. Learning everything you need to pass the civil PE exam. Just sign up! We will refer you to great books tand resources that will help you ace the FE and the PE exams. We will work free video practice problems step by step. Yep, step-by-step. And did I mention free? Provide excellent PE breadth practice exams that are similar to the real thing. Offer excellent PE depth exams covering all 5 major topics including: tranportation, geotech, structures, water resources, and construction! Give killer tips, tricks, tactics. Anything and everything to do with passing the FE, PE, and your career as a civil engineer! Provide challenging FE exams that will help you understand what to expect on the actual exam. We just added our PDH storefront as well! If you need PDH's to keep your PE license going, look no further. We can help with that, too!